I’m an optimist, a dreamer, a believer—that things change, people change, miracles happen, the impossible is possible. This positive bent is a gift to me and to those around me…but sometimes it gets me into trouble down here in the real world. As you well know if you also live in the real world, sometimes things and people don’t change, miracles don’t show their sparkly faces, and the impossible stays firmly out of reach. Those of us with high hopes have further to fall when disappointment inevitably strikes, and the force of that blow can instantly replace our passionate optimism with an equally hefty amount of cynicism and despair. But it’s not our nature to stay in that hopeless state; thus we begin again to climb upwards. And while I love riding roller coasters at theme parks, those of the emotional variety make me sick and aware that I need to get off this thing. While there’s still room in my life for staggeringly great expectation and deep grief, I’ve been working on growing where I’m lacking, which is the middle ground between the two extremes—acceptance. Acceptance is not flashy. It deals with situations exactly as they are and encourages me to welcome into my life every angle, which usually includes a dash of hope and a sprinkle of disappointment. Acceptance leaves me room to dream of a brighter future but gently reminds me that this life is hard, while remaining a firm emotional footing on which I can stand. Thus acceptance is a quiet friend I’m inviting over more often these days. To cultivate acceptance I’ve developed an unorthodox practice that’s simple, quick, and fun. Why unorthodox? Well, it’s a three-step process which includes a mindfulness posture, a prayer, and a country pop jam session—an atypical combination, I know. But, hey, sometimes you’ve got to think outside the box to find your secret sauce! I'm happy to lead by example. I do this five-minute exercise when I notice myself trying to control an uncontrollable circumstance or becoming very emotionally attached to a particular outcome. Are you ready for it? Nope, not in the theoretical sense--I told you this was easy, remember? Physically open your hands, palms facing upwards. There’s something about making tangible in our bodies what we want to happen in our spirits; an outward shift becomes a catalyst for an inward shift. As you open your hands release your expectations and bravely welcome reality. 2. Pray the Serenity Prayer. There’s so much good stuff here, but I’ll just mention what has been meaningful to me recently, which is the last two lines of the prayer, a beautiful reminder that Jesus-believers can be reasonably happy in this life and supremely happy with God forever in the next. You’ve oriented your mind towards acceptance. It’s almost time to get out of your head and back into your boots-on-the-ground life. To groove through that transition listen to Bebe Rexha and Florida Georgia Line’s country pop hit, “Meant to Be,” an upbeat song that will get stuck in your head and help you maintain a chill vibe all day long. Trust me. That's it! I dare you to try it. Did you try out my quirky method? How do you cultivate acceptance and stay off the emotional roller coaster? Let me know in the comments below. One of my favorite Christmas movies is the 1946 classic, It’s a Wonderful Life. 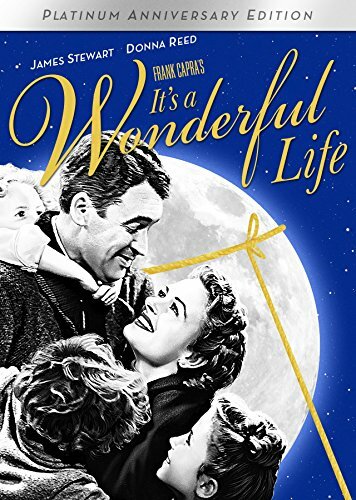 The movie tells the story of George Bailey, a good-hearted but discouraged man who is given the unique experience of seeing the world as if he'd never been born. He learns a good deal along the way, and we can learn from his journey as well. If you haven't seen the movie or need a refresher, I've provided one in the next two paragraphs. If like me you've watched this holiday film several times this year, continue on to find 10 Things I Learned from George Bailey. Disclosure: This post may contain affiliate links, which means that I may receive a small commission if you make a purchase through one of the links I've provided here--at no additional cost to you. Please check out my disclosure policy for more info, and thanks for your support! George is a benevolent man who sacrifices his dream of traveling the world in order to run his family’s business, a bank that provides loans based on trust and consequently homes for families who otherwise could not afford them. The wealthy and conniving Mr. Potter continually tries to take over The Building and Loan, and time and again George chooses to do what’s in the best interest of the people of his community instead of advancing his career or making his life more comfortable. He watches while his brother and friends achieve great success and wonders if his holding fast to principle is worth it. In a series of unfortunate events, including the loss of a large sum of money which could result in bankruptcy, George becomes so distraught that he makes his way to a snowy bridge, intending to end his life. Before he can jump, a kind old man, who is actually an angel named Clarence on a mission to earn his wings, jumps into the raging river below and shouts for help. George dives into the river to save Clarence, while Clarence insists that he jumped in to save George. Clarence then takes George on a walk through town, showing him what the people and places familiar to him would be like if he’d never been born. George is surprised to see how different the world is without him in it and realizes that he actually does have a wonderful life. When he returns to reality, the friends and neighbors whom George has helped over the years rally together to give money in order to save the bank and encourage George, and Clarence has earned his wings. 1. Discouragement is the worst! It’s a Wonderful Life opens on several stars in the night sky—presumably God and several angels—talking about George’s predicament. Clarence, George's guardian angel, says, “Is he sick?” The “God” being says, “No. Worse! He's discouraged.” Discouragement can be nearly debilitating, and perhaps it's such a formidable foe because it flies under the radar. Major crises like death, illness, and divorce scream at us, while discouragement whispers to us. Because our lives are more obviously affected by the “big” things, we’re more likely to seek help and growth through them. “Little” issues like discouragement don’t seem to warrant our time and attention, so they’re allowed to live on unchecked, and there’s nothing “little” about the influence they have on our lives. 2. The most valuable investments are relational. George and his wife experience the joy of helping a poor family move into their first home, and immediately following the celebration George watches his old buddy Sam pull up in a fancy car, and Sam’s wife steps out wearing a fur coat. George sees the contrast between the life he could have had and that which he’s chosen numerous times and still continues to value people over possessions. He celebrates the successes of those in his life—his brother’s receiving a congressional medal of honor among them—even when he’s experiencing hardship. 3. Boundaries are good. Though the primary lesson we learn from George is one of putting others before oneself, we see another side to his benevolence: someone says of George, “he never thinks of himself; that’s why he's in trouble.” No one could live the life George Bailey lived and not experience some serious burnout. There’s a fine line between being willing to help anyone at any time and having no boundaries which protect yourself and your family. Prioritizing oneself may seem selfish to the outside observer, but those who take care of their own selves are much healthier and better equipped to help others. 4. Unresolved anger eventually erupts. George experienced so many setbacks, it’s no wonder he grabbed his uncle by the collar, lashed out at his children, and yelled at his daughter’s school teacher; he had good reason to be mad. Anger needs an outlet, and knowing this can help us find an appropriate channel that works for us so that we don’t hurt our loved ones with our explosions. 5. Help often comes in a different way than we expect. When the odd Clarence tells George that he is his guardian angel, George says sarcastically, “Well, you look about like the kind of an angel I’d get.” Help often comes to us similarly—in a different package then we expected. Recently I was in a situation in which I had to ask for help from someone towards whom I’ve had many judgmental thoughts. Help was given, and I was humbled. 6. Prayer works. George prayed desperately in the bar: “Dear Father in heaven, I'm not a praying man, but if you're up there and you can hear me, show me the way. I'm at the end of my rope.” His prayer was not pretty or articulate, but it moved God to send Clarence. I believe God would rather have our desperation and honesty than our polish and pretension any day. 7. Each man’s life touches many others. Seeing his town as if he’d never been born helped George realize that he had been a powerful force for good in his community. For instance, George may have felt like he wasn’t making much of a difference when he loaned a little money to his struggling friend, Violet, but in the universe in which he didn’t exist she was fighting with the police on the street. We don't get to see what others' lives would be like if we weren't in them, but we should never underestimate the power of a small act of kindness, a friendly conversation, or a humble service. 8. We need other people. George never found the lost $8,000, but his friends and neighbors saved the day by donating enough money to cover the loss. Without their help, George’s bank would have gone under. I’m pretty independent, so sometimes I forget that I need other people. This week a friend was able to encourage me in a way that only she could have done, and it brought me some hope that I could never have manufactured on my own. 9. There will always be naysayers. When George and Mary walk down the aisle, we see Mary’s mother crying, and they aren’t tears of joy. In the end she comes around and donates money to help George’s cause. Some of our critics will change their minds about us too. But not all of them will, just as Mr. Potter remains greedy and grouchy, and we shouldn’t be surprised by this. 10. Helping others helps us. On occasion when I’ve been feeling sorry for myself for some reason or another, my husband has suggested that I help someone else so that I’ll feel better. I admit I haven’t been too appreciative of that recommendation, but he is right—when we’re feeling blue, helping others takes the focus off of ourselves, gives us a perspective check, and benefits someone else. Saving Clarence from drowning saved George, and helping George allowed Clarence to earn his wings. And George Bailey’s life and legacy have helped us too! It's a wonderful life! Merry Christmas. Summer has always been my favorite season due to the wider range of possibility she brings. I say she because she is a dear friend, and she is a blast! I always welcome her return. My first few years of post-college jobs were spent working for a high school and university, where work was slower in the summer months, so from childhood to adulthood Summer has given me the gift of a freer schedule. More discretionary hours and warmer weather translates to more options and opportunities for adventure. One glorious summer I spent a week in Dallas—complete with a Six Flags visit--to be a bridesmaid in a wedding, traveled to Nashville for the Country Music Awards Festival, went on a float trip to Arkansas, threw myself a birthday party, spent two weeks in Alaska hiking, kayaking, and moose-watching, had several job interviews, and also enjoyed my fair share of Summer’s everyday delights—bike rides, game nights, movie nights, Sonic runs, picnics, and laying out by the pool. Did I mention that all these events occurred in just over six weeks? In case you hadn’t noticed, I love to go and do. When the first cool day happens each autumn, I observe a moment of silence for the passing of Summer, and I’ve been known to shed a tear on this occasion, knowing that my exciting, up-for-anything friend won’t be around again for three quarters of a year, which seems like a very long time. In her place comes Fall, a much more laid-back companion. She’s not as much of a party girl, and I wouldn’t necessarily describe her as “fun to be with,” but if I’m honest, her arrival is a relief. You see, Summer has me racing from one experience to the next so fast that I can’t catch my breath. Despite the grand time we have, my body and even more so my soul—the very core of myself—begins to feel tired and unbalanced, like something is missing even amidst all the activity. Though Fall has a busyness of her own, she’s not likely to entice me to the kind of crazy calendar I described to you earlier. Her chilly weather and back-to-normal routines narrow the options for me and encourage me, my soul, to take a deep breath, put on a cozy sweater, get lost in a good book, and sip a pumpkin spice latte. Where Summer urges me to go and do, Fall reminds me to be. To be content. To be myself. To be present. To be quiet. To simply be. I was created—both soul and body—to both do and be, to work, play, and rest. The concept of Sabbath suggests a regular rhythm for work and rest, as does my body’s need for sleep at the end of every day. I wonder if the seasons of the year were also intended to serve as reminders that I need to engage in many different states of being in order to be a whole, healthy person. I don’t know, but this year I’m allowing Fall to slow me down and to give me the time and space and permission to rest and to reflect…over a pumpkin spice latte. How will you allow Fall to help you to simply be? Tell me in the comments. “Give him the wiper!” Such were my college roommate’s fervent instructions from the passenger seat as a car cut me off in traffic. “Excuse me?”, I said. “You know, the wiper!”, she said as if I should know about this. I didn’t, so she explained. “The wiper” is the straight-laced cousin of the infamous middle finger. When behind the wheel and enticed to make an angry crude gesture due to the actions of another driver, someone employing “the wiper” would simply click their windshield wipers on and then click them off again after one “wipe,” trading a flip off for a flip on and off. I tried it, and it made me feel better. It also made me laugh…which made me feel even better. This clever tool, imperceptible to the offender, was useful in dispelling road rage, and several years later I found it to be especially helpful following a breakup. There’s no avoiding an ex-boyfriend in a small town, particularly when said ex drives a red car. I could see that thing coming for miles, and it stirred up all sorts of angry feelings. How could he drive around so shamelessly as if he hadn’t just broken my heart? Soon after these thoughts began, I’d hear my roomie telling me, “Give him the wiper!”, and I would, and I’d feel a little better, a little lighter. Sometimes I’d chuckle because of the ridiculous nature of the practice and because I felt like I knew something he didn’t know, a happy secret. What was really going on here was something called catharsis. Catharsis is basically any action—such as a quick flick of windshield wipers—that allows emotion—like anger—to be expressed, which in turn causes tension to be released. The action gives the emotion a place to go, and that place is away from oneself. I don’t know about you, but as an upstanding member of society and particularly as a Christian, sometimes I need to be reminded that expressing emotions, even negative ones, is healthy. I’ve learned that anger and sadness don’t simply disappear into the universe given enough time. They may lessen in intensity, but they will dissipate into my thoughts, words, and actions, affecting my work, health, and relationships. We don’t need to spend all of our time and money on counseling in order to exercise good emotional hygiene—though I consider counseling a worthy investment. There are plenty of simple ways we can express negative emotions constructively, experiencing the immediate benefit of cathartic release and long-term bonuses of peace of mind, increased ability to be present, and general pleasantness to others. Journaling - That notebook and God won’t tell a soul, and guess what? They can handle your junk. Conversation - Verbal processing with a friend can help you feel heard and understood. Vent to a mature friend who neither lets you plot murder nor condemns you for wanting to do so. Exercise - Fitness junkie or not, I bet that like me you’ve occasionally been so mad that you just had to do something physical. Don’t punch a wall; go for a run. Crying - This may be more of a necessity for girls than guys, so, ladies, if we’re crying just to cry, let’s make sure to spell this out for any men in the vicinity so they know they’re not in the doghouse and we don’t need to be sent to the nut house. How have you experienced catharsis? What’s your go-to for expressing negative emotion in a healthy way? Tell me in the comments.